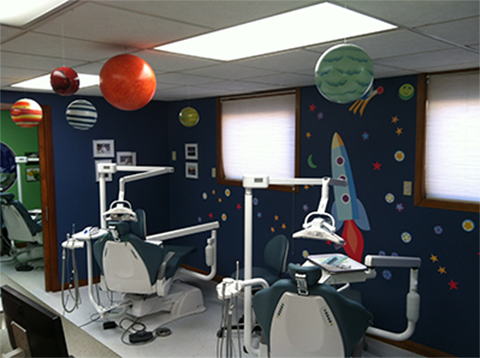 Welcome to our Pediatric Dental Office! It is our pleasure to serve you by providing high quality, personalized, and gentle dental care to your children. Dr Maria C. Evangelisti and her staff have been trained to treat young, apprehensive, and special-needs children so they feel safe and comfortable about seeing a dentist and taking care of their oral health. We are dedicated to providing excellent dental health care for infants, children and adolescents in a caring and gentle environment. We welcome parents to accompany children during treatment and we promote parent/doctor open communication in our office. We offer our patients a state-of-the-art pediatric dental facility, including digital x-rays. We are environmentally aware and strive to obtain a paperless office. We offer both nitrous-oxide as well as oral sedation services for children with behavioral anxiety to make them feel at ease and relaxed during dental treatment. 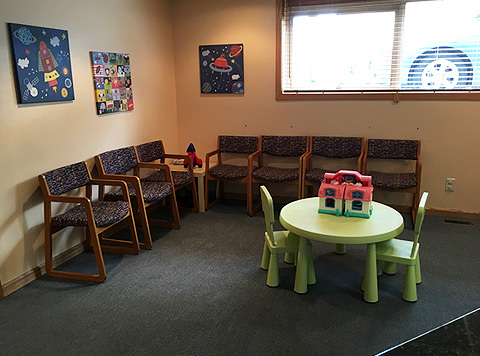 Waiting Room - Here we have plenty of games and toys to keep your little ones preoccupied while they wait for their siblings or if you arrive early for your appointment. 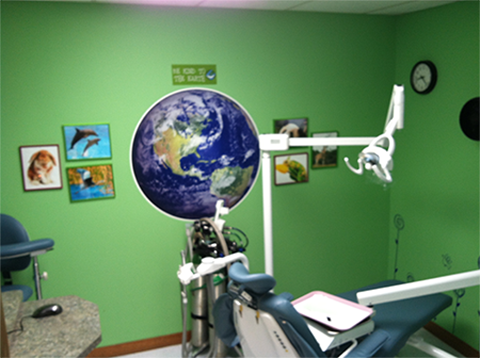 Space room - This is where your child will be seen for their regular check-ups and dental cleanings.
. Earth Room - This is where Dr. Evangelisti works to get rid of the 'sugar bugs' (cavities) and makes your child's teeth strong and healthy again. 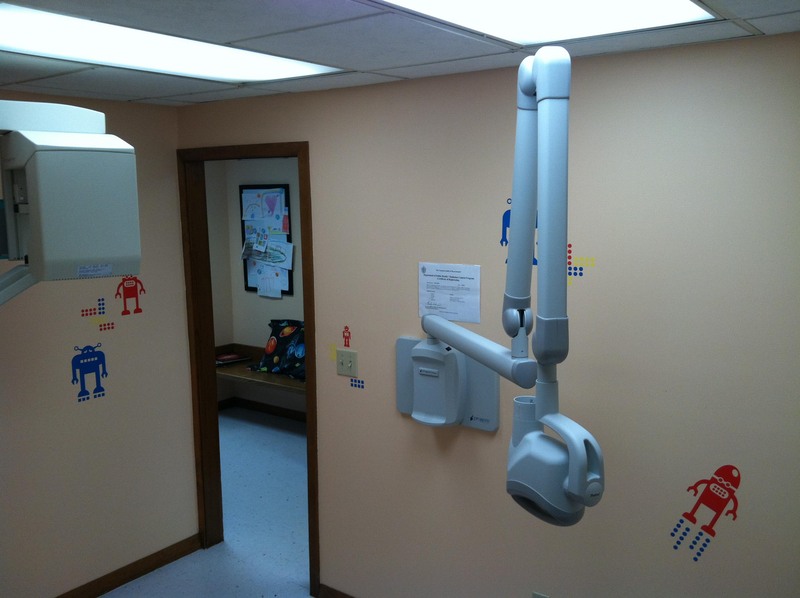 Robot Room - In here we take digital x-rays, or pictures, of your child's teeth to ensure everything is healthy. 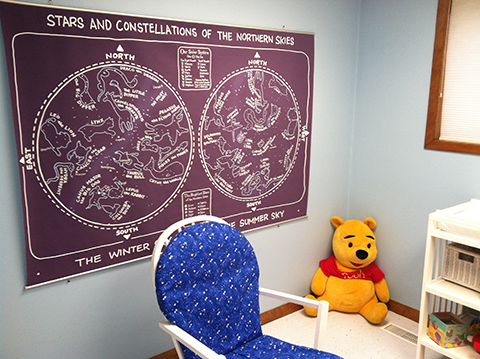 Nursery Room - If your child is under 3, or very apprehensive, this is where they will have their first visit with Dr. Evangelisti. This room is designed to be familiar to the younger children with a rocking chair, instead of a dental chair, and plenty of toys and stuffed animals to hold their attention. Please, call us today for more information on your child's first visit with us.